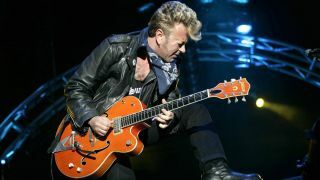 Generally, rockabilly makes heavy use of the well-known I-IV-V blues progression. In the key of E the chords are E-A-B; in the key of A it's A-D-E, and 6th, 7th and 9th versions of these major chords (such as E6, B9 and so on) give a more authentic sound. Try improvising around A6, D9 and E7, for a typical rockabilly I-IV-V in the key of A. Notice that we've marked two shapes as 'for lead' because they are great for country and rockabilly style soloing, particularly if you use the trick of pulling off to the open second string. That said, you can treat them as standard chords if you prefer. It's up to you.